Sulzbach-Rosenberg. With eyes closed, fervently pressed against his cello, Misha Quint sat on stage. The world-famous New Yorker of Russian extraction listened carefully within himself and his cello, playing often with his eyes closed, reveling in the singing tone of his instrument. 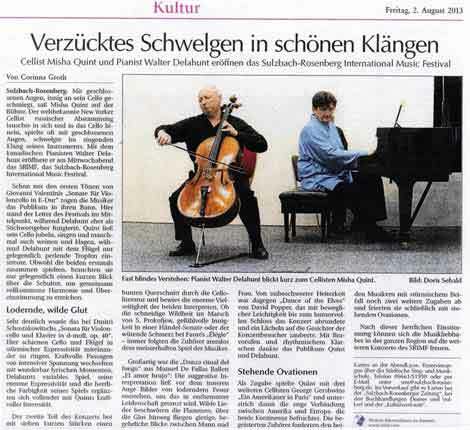 With Canadian pianist Walter Delhunt, he opened the SRIMF, the Sulzbach-Rosenberg International Music Festival, and this Wednesday. With the very ﬁrst notes of Giovanni Valentini's ʻSonata for Violoncello in E Majorʼ, the musicians drew the audience into their spell. The festivalʼs leader stood at the center of attention here, while Delahunt acted as more of a source of inspiration. Quint made his cello rejoice, sing and sometimes weep and moan, while Delahunt on the grand piano only occasionally cast in sparkling drops. Although they played here together for the ﬁrst time, only a casual glance over the shoulder was needed to achieve perfect harmony and accord. This became quite clear in Dmitri Shostakovitchʼs ʻSonata for Violoncello and Piano in D minor, op. 40ʼ. Here, the cello and piano seemed to grapple with one another with stormy expressivity. Powerful passages of intense excitement alternated with wonderfully lyrical moments. Delahunt's variable touch, his enormous expressivity and the magniﬁcent colorfulness of his playing were perfectly complemented by Quintʼs powerful intensity. The second part of the concert offered a colorful cross-section of the cello literature in seven short pieces, proving the tremendous versatility of the two performers. Whether the cutting savagery of S. Prokoﬁevʼs March, the emotional ardency of a Handel Sonata or the raging agony of Fauréʼs ʻElégieʼ - the listeners followed the playing of the two masters breathlessly. The ʻDanza ritual del fuegoʼ from Manuel de Fallaʼs ballet, ʻEl amor brujoʼ was superb: their suggestive interpretation conjured up images of a blazing ﬁre around which ﬁgures dance with unbridled passion. Wild songs adjure the ﬂames and over the embers ﬂy greedy, covetous glances between man and woman. By contrast, David Popperʼs ʻDance of the Elvesʼ delighted the audience with unburdened cheer, rounding out the concert with nimble lightness until its humorous end. The audience thanked Quint and Delahunt with loud bravos and rhythmic clapping. As an encore, Quint played George Gerschwinʼs ʻAn American in Parisʼ with three other cellists, underlining the close connection between America and Europe with enriches both continents. With rapturous applause, the enthusiastic listeners demanded two further encores and celebrated them with standing ovations. After this a magniﬁcent beginning, music lovers of the entire region can look forward the further concerts of the SRIMF.